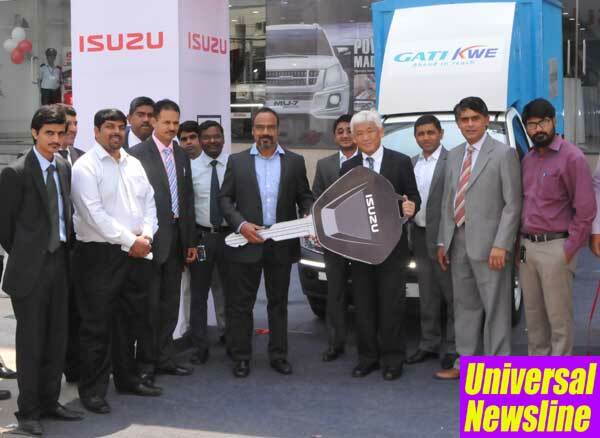 Hyderabad: With an aim to offer better and seamless intra-city transportation, leading express distribution and supply-chain solutions provider - Gati-Kintetsu Express Pvt., Ltd. (Gati-KWE) has taken delivery of 50 units of ISUZU D-MAX pick-up trucks. This is a significant cross-country order Isuzu Motors India (IMI) has bagged for the pick-up. Isuzu Motors India, with its extended D-MAX range has become the preferred choice for many large enterprises like Gati-KWE. Mr. Shigeru Wakabayshi, Deputy Managing Director, Isuzu Motors India handed over the vehicle keys to Mr. Bala Aghoramurthy, President and Whole Time Director and Bablu Tewari, Chief Supply Chain Operations Office, Gati-KWE in Hyderabad, today. Gati-KWE plans to deploy this new fleet of 50 ISUZU trucks to further strengthen its last mile reach and connectivity from strategic locations to Tier-II and Tier-III geographies. Gati Limited is India’s pioneer in Express Distribution and Supply Chain Solutions, committed to make their customer's business always ahead while partnering with them to elegantly customize the delivery offering. The company, in the last one year, has expanded its operations to sectors like e-commerce that focuses on time-bound delivery. A leading global player in the pick-up segment, ISUZU has been significantly increasing its presence in the Indian market with its range of D-MAX pick-ups that are best-suited for Indian usage patterns and conditions. The ISUZU D-MAX has been gaining solid traction across various business segments, thanks to the unbeatable value proposition it offers to the customers. Gati-Kausar (a cold-chain arm of Gati Limited) has been using a fleet of 4 ISUZU D-MAX Reefer trucks, since March 2015. The award winning ISUZU D-MAX is tough, reliable and fuel efficient. It is built on a heavy-duty chassis that has ISUZU’s legendary durability and superior performance, making it one of the most competitive pick-up trucks in the country. ISUZU rolled out the locally assembled D-MAX range of pick-ups in India in 2014 and since then, the product has been offering immense value to the customers operating across various businesses. The ISUZU D-MAX is designed to meet all practical requirements of the end-users and have proved its performance across applications like Reefer, Food & Catering, Distribution, Hardware Transportation, Service Vehicle etc. The ISUZU D-MAX has a large and wide cargo deck that can carry loads with ease. The cab of the ISUZU D-MAX is made from high-tensile steel that ensures greater safety, while the front and rear suspension provide greater stability to the vehicle. Powered by the legendary ISUZU engine technology the product offers practical features that helps customers to achieve business efficiency. The ISUZU D-MAX is also available in Cab-Chassis and A/C variants offering customers a wider choice suiting their business requirements. A completely new concept in India, the new ISUZU D-MAX SpaceCab’s unique feature is its extended cabin space of 1.5 feet behind the drivers’ seat, which can store valuable/ fragile goods. It offers significant features like power steering, power windows, centralized door lock, etc. With the ISUZU philosophy spanning over 99 years, the company is the threshold of a very important milestone to embark on a new journey in India. Having its history tracing back to a century, ISUZU has achieved several milestones in the areas of Commercial Vehicles and Diesel Engines and has established itself for qualities such as Durability and Reliability. Isuzu Motors India is rapidly expanding its dealer network in the country and has plans to open more outlets once localised production begins at its new factory at SriCity, in Andhra Pradesh. ISUZU currently has 27 dealership facilities - Delhi, Noida, Jaipur, Mumbai, Chennai, Bangalore, Hyderabad, Coimbatore, Madurai, Visakhapatnam, Tirupati, Cochin, Calicut, Ahmedabad, Rajkot, Ludhiana, Lucknow, Gurgaon, Indore, Vadodara, Kolkata, Jalandhar, Chandigarh, Jodhpur, Nagpur, Faridabad and Pune.